Mama had BAGS AND BAGS of kibble sitting around last night. I just had to check it out. It smelled really good, but I didn't open any of the bags. Still, Mom scolded me. "No, Sebastian, that's not for you. Get out of those bags. That food is for less fortunate kitties." Mom explained that Chain of Hope was out of cat food and needed donations to take to the kitties they help out on the streets. She said it's getting cold and there were kitties who lived outside all the time. It's hard for me to believe that there are kitties who don't have a warm bed to sleep in at night, but I'm glad that there are nice people like Chain of Hope to make things a little better for them. If you can donate to Chain of Hope, please do so. They're out there, in the streets, day after day, helping less fortunate animals. Follow them on Facebook and you can learn about what they do. They're a great group! 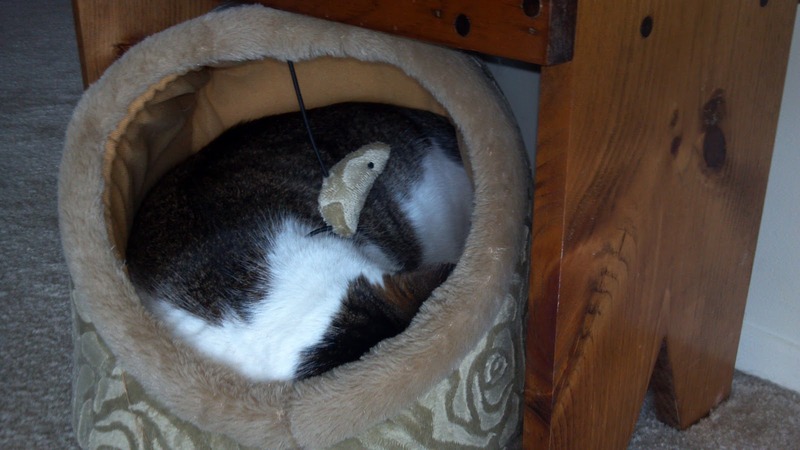 This week's Featured Furry has a funny name: Fast Forward. 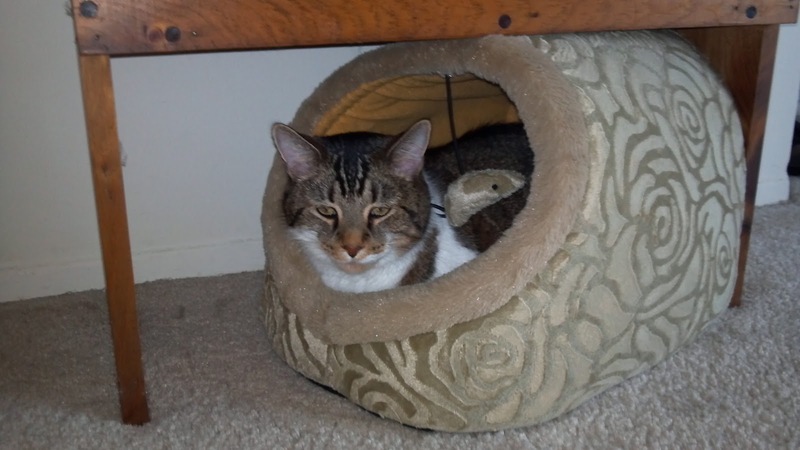 He is 9 years old and was admitted to Wayside Waifs as a stray. He was quite matted when he arrived, so he had to have a haircut, but I'm sure his full coat is beautiful! He has a cool little crinkly ear too. It really adds character, don't you think? He's very friendly and loves to be petted. He will need to be groomed to keep his long coat in tip-top shape, but that's just another way to have some quality time together! Check out his video on his page and you'll see Mom petting him and talking about him. She just better not think about bringing him home! UPDATE: Fast Forward has gone to his forever home! Back in August I introduced you to a pair of kitties who need to be adopted together, Jellybean and Veronica. Well, they're still waiting for their forever home! This weekend, they have their chance to find the perfect family. Wayside Waifs in Kansas City is having a special promotion called "Find Your Boo" starting tomorrow at 2 PM. During this event, all pet adoption fees will be HALF PRICE! 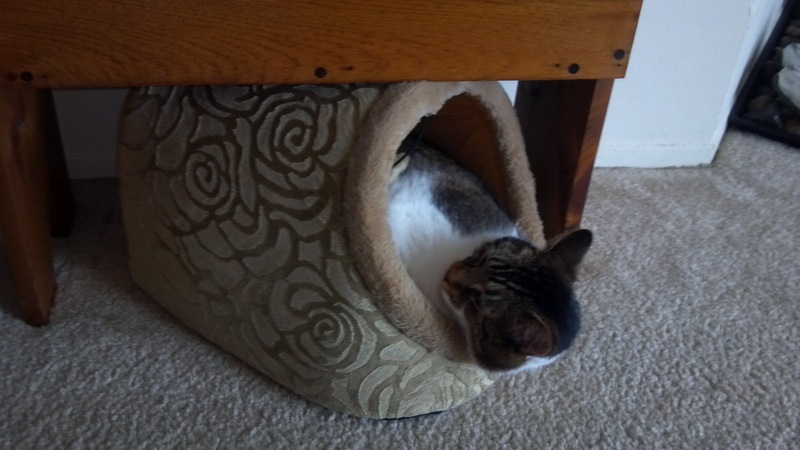 Surely this will be the weekend when these two lovely kitties get to move out of the shelter and live in a real home! Jellybean and Mom's newest tattoo, modeled after the black beauty on her lap! Veronica. Doesn't she have the most amazing whiskers? If you're looking to add a pet to your home, this is the time to do it! How can you beat a deal like half price adoptions? Even if these gals aren't the right fit for you, stop by and say hi to them, and tell them Sebastian sent ya! Duplicity Dogged the Dachshund is the second installment in the Dixie Hemingway Mystery series by the late Blaize Clement. In the series, Dixie, a former law enforcement officer is now a pet sitter in Sarasota, Florida. During her pet sitting duties, she finds herself discovering dead bodies and ending up in the middle of the investigation. 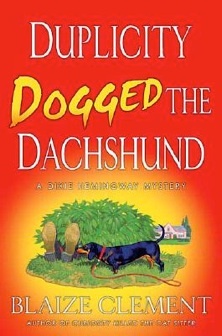 In this book, Dixie is walking a dachshund when the dog finds a body. Dixie is once again in the middle of the case, at times working with Lieutenant Guidry who is handsome (probably not as handsome as me) and a bit mysterious. Dixie, not able to fully escape her law enforcement past, begins asking questions and ends up being chased by a psychopathic killer. This was a pretty good book, but my one complaint is there were dogs in it but no cats! *sigh* There better be cats in the next book! Speaking of the next book, I plan on reading the entire series. There is going to be one more Dixie Hemingway Mystery published (the seventh installment) that Ms. Clement wrote before her passing. After that, it is planned that her son will carry on the series. I hope he writes about cats. There's a quiet girl at Wayside Waifs in Kansas City who is waiting for her forever home. 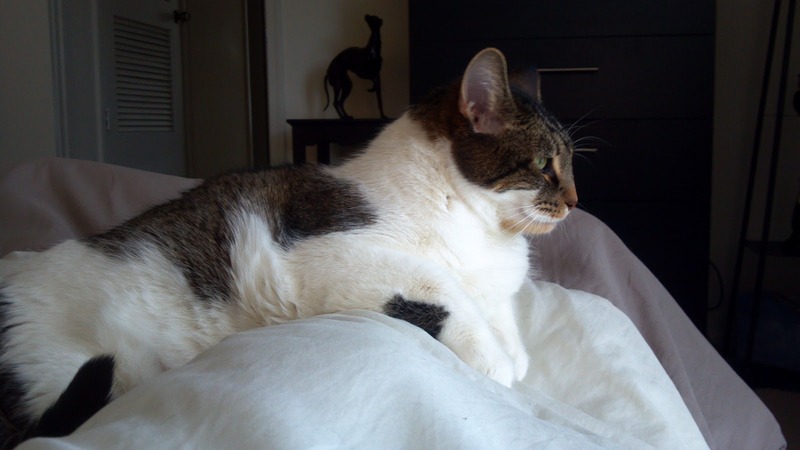 Jasmine is a 3 year old domestic shorthair. Most often, you'll find her on a shelf in Meow Mansion, minding her own business. She's rather shy, so you have to approach her slowly. Once she's comfortable with you, she enjoys being petted. Don't those eyes just speak to you? One thing she really likes is playing with a wand toy. Volunteer Kathryn commented that once after playing with her, Jasmine was very affectionate. 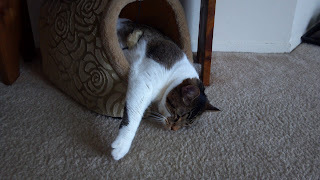 She must have felt much more relaxed after a good play session! Jasmine's Glamour Shot. Picture by Cathy Sherman. Mom thinks that Jasmine may have been feral-did you notice that her left ear is tipped? It just might take a little extra time for her to settle in somewhere if she's lived on her own her whole life. She's been at Wayside for about 3 months now, so she's experienced the love and caring of lots of people though. Hopefully that will make the transition into a family easier! Some of you may have read my tweet on Monday about my barfisode on the newly cleaned carpets. I haven't had a barfisode in quite a while, so I thought it was about time and I couldn't pass up the opportunity to break in the clean carpet! So, I nommed on a grass plant on the deck then I puked in two seperate places in the hallway. Luckily, Mom had a couple of these new Bissell Stomp 'N Go pads handy. She wiped up most of each barfisode, then put down a pad on each spot, pressing down on the plastic backing that kept her foot from getting wet. The directions say to leave on the spot for at least 30 minutes (and up to 24 hours), so after half an hour Mom checked, but the stains were still there. She put the pads back down and left them on for a total of an hour and a half. She picked them back up again, threw the pads in the trash, and waited for the spots to dry. The first stain, the bigger of the two, is completely gone! Mom isn't even sure if this is the exact spot where I puked because it came out so well! The second, smaller stain is still a little visible, kind of a darker spot on the carpet. (By the way, Mom wants to point out that the big dark area on the left of the picture is just a shadow.) Mom thinks if she had left the pad down longer on this stain, it would have come out as well as the larger stain. Final verdict: Pretty good product! Mom likes the convenience of the pads. They are individually wrapped and there's no elbow grease involved. Just throw them on the spot, plastic backing up, and press down with your foot. Walk away for a while, then throw the pad away. We received two Stomp 'N Go pads free from Bissell. This in no way influenced our review of the product. The opinions stated in this review are our honest thoughts on the product. In fact, Mom is going to buy a box to have on hand for my next barfisode!